Welcome to the March 2019 Non-Release Design Team Blog Hop & GIVEAWAY! 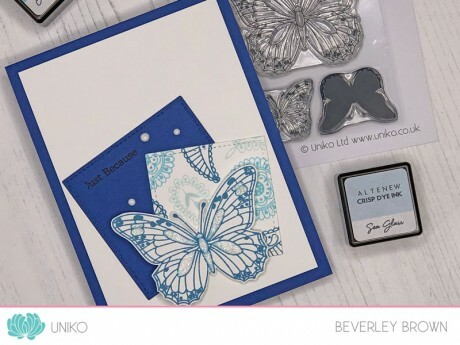 Here at Uniko HQ it is just myself behind the screen, blogging, designing, packaging stamps & orders through the Uniko online shop, customer service and all the things in between. I *usually* release new product every other month for a number of reasons, but mainly so I can keep up with everything! On non – release months like this month I like to set myself and the Design Team a challenge to look back at a previously released product and give it some more love. With Spring just around the corner here in the Northern Hemisphere, I thought it would be nice to give some fresh inky love to Spring Botanicals Daffodil, Spring Botanicals Snowdrop and Stencil Bright Butterflies. 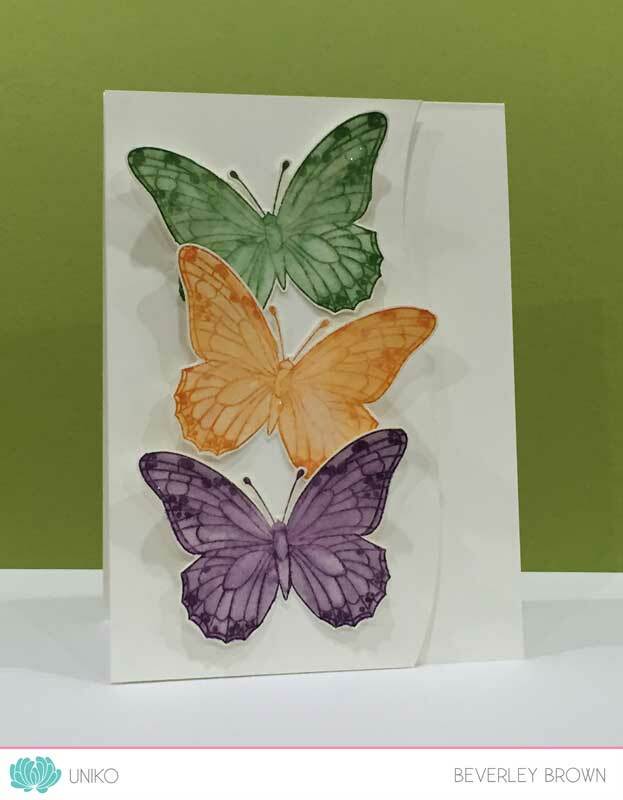 As usual we have our GIVEAWAY, so be sure to comment along the hop for your chance to win Spring Botanicals Daffodil and Stencil Bright Butterflies (an alternative prize to the same value will be offered if the winner already owns these). You have until Midnight (GMT) Saturday 16th March 2019 to comment, winner will be announced shortly after. 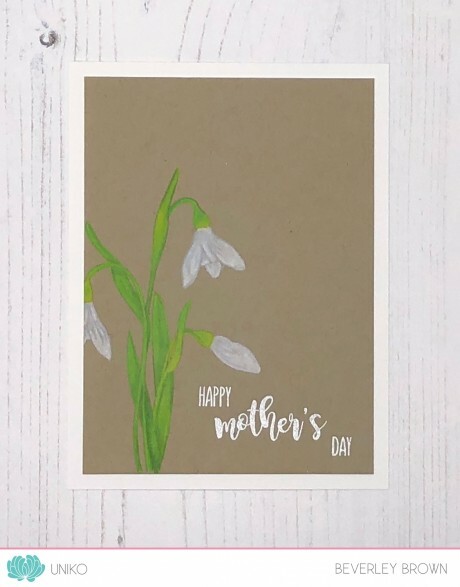 I’ve created a trio of cards to share with you today using all 3 products and some different techniques on each of them. 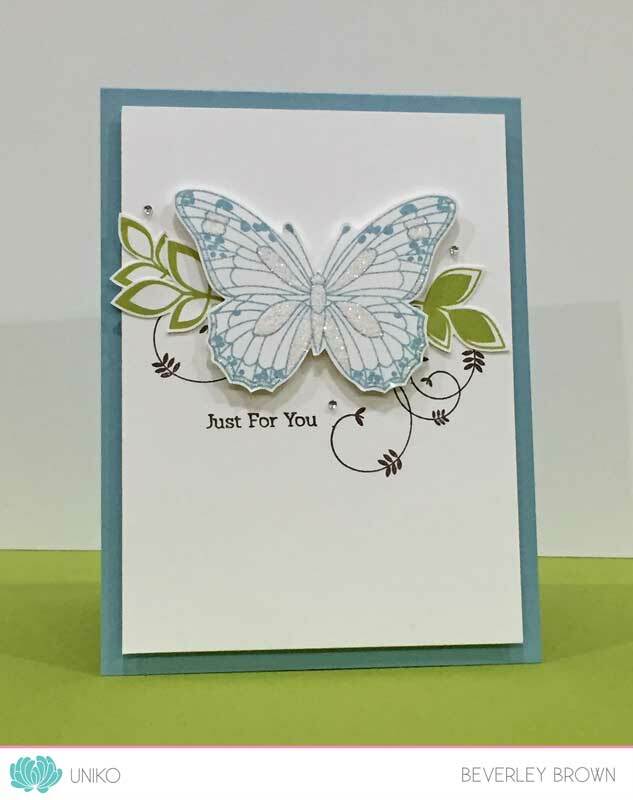 I’d created this scored Basic Grey (Stampin’ Up!) card base probably more than a week ago. 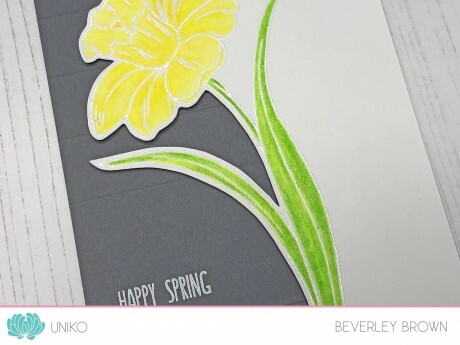 I’ve been loving the trend I have been seeing around social media of adding embossed scored lines to cards. 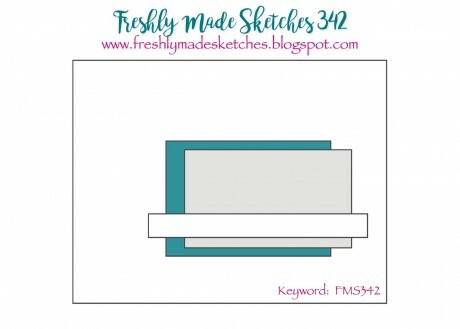 After purchasing a new Fiskars mini paper trimmer with interchangeable blades, I had to give it a go! 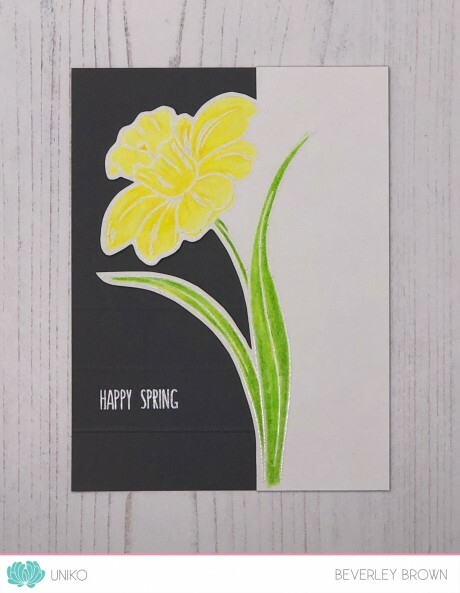 I decided to do some partial fussy cutting of the daffodil, which is stamped in VersaMark ink and heat embossed with detail white EP. I used Prismacolor Pencils to colour the daffodil and adhered the panel to the scored card base using foam adhesive. 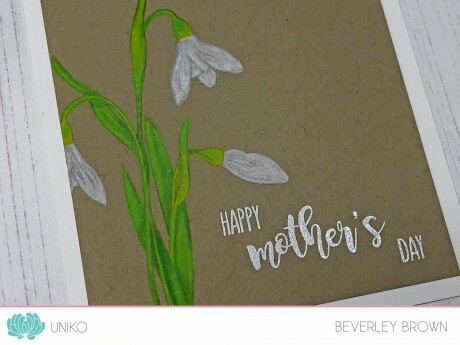 The sentiment is also from Spring Botanicals Daffodil and heat embossed. 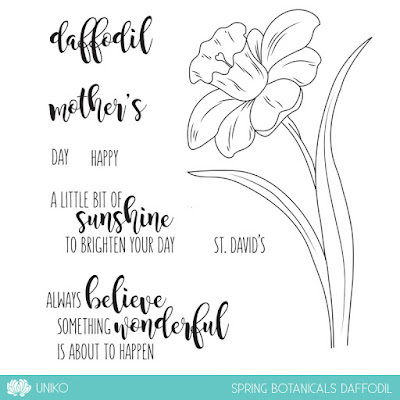 The sentiment is from Spring Botanicals Daffodil and again is heat embossed. Earlier in the week I’d seen the sketch from CAS(E) this Sketch! 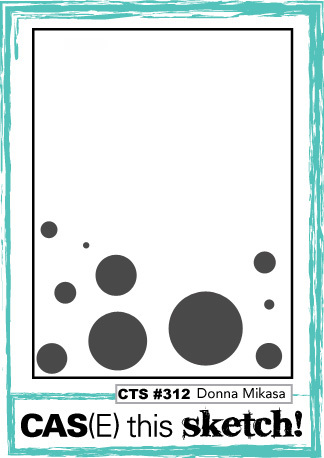 seen HERE and blelow, and thought it would be perfect for some stencilling! 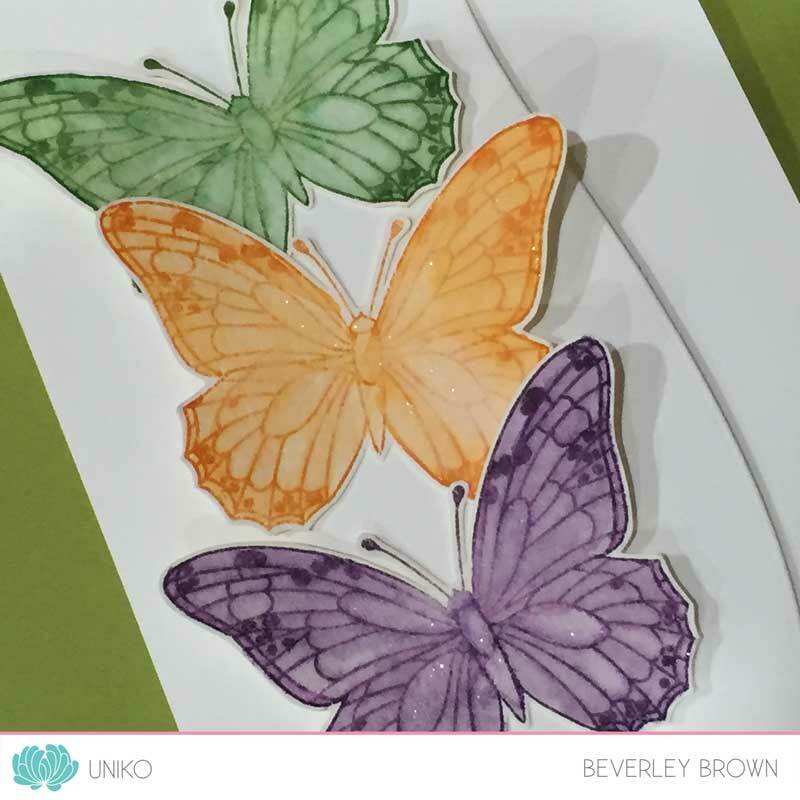 I used my ink daubers to selectively ink the butterflies and flowers and I simply chose some bright Altenew ink colours (Fresh Lemon, Orange Cream, Aqualicious and Rubellite). I then went over the top with Nuvo Moonstone Glimmer Paste – love this stuff! I finished the card off with a sentiment from Simply Said Blocks II. Thanks for joining in on the fun. Did you all enjoy the Thyroid Awareness Month Blog Hop? I sure did and it was a great way of learning and getting to know more about the condition in a fun and creative way. If you missed it and want to catch up on the inspiration shared you can see my original post HERE. My apologies for taking so long to announce the winner of the Uniko £30 prize package I was offering to one lucky commenter on my post. With the Uniko 7th Birthday & February Release celebrations I was super busy and it slipped my mind. Then at the end of last week I was poorly with a tooth abscess, went to see the dentist and ended up having an extraction the following day. I am really phobic of the dentist, cried like a baby just being examined and then I have to be sedated for any treatment. I am almost recovered, my mouth is still a little sore, but I feel loads better and in less pain!! background panel is so amazing! I need to look at that stamp set! Congratulations Lucy! 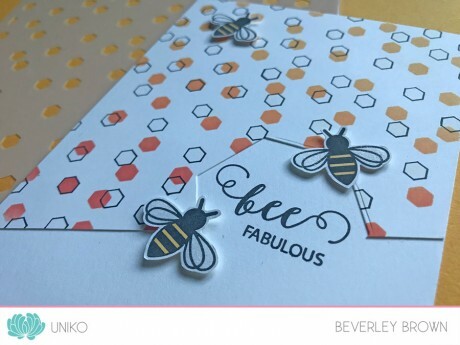 Please email me at bev@uniko.co.uk along with your mailing address and I will get your prize in the mail to you. 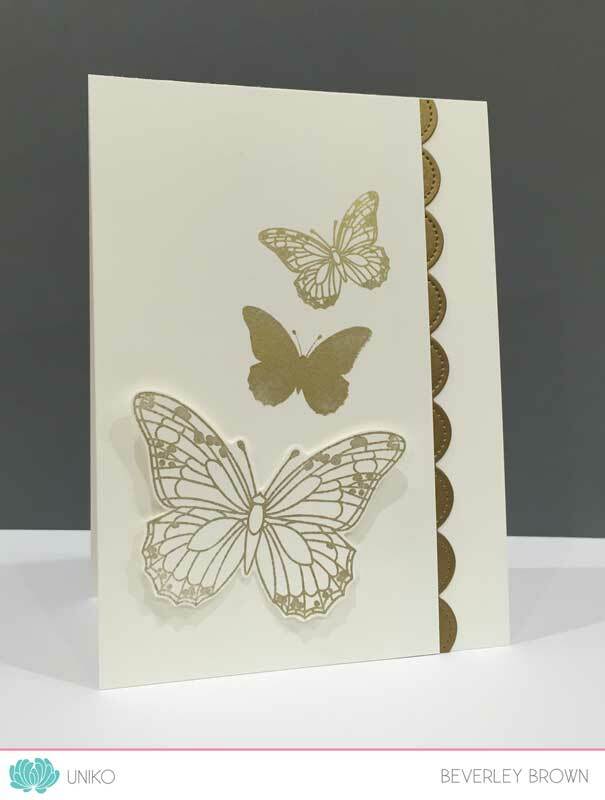 Beautiful sparkly butterfly card. I like how you used paisley too. Congratulations Sue! Please email me at bev@uniko.co.uk along with your mailing address and I will get your prize in the mail to you. 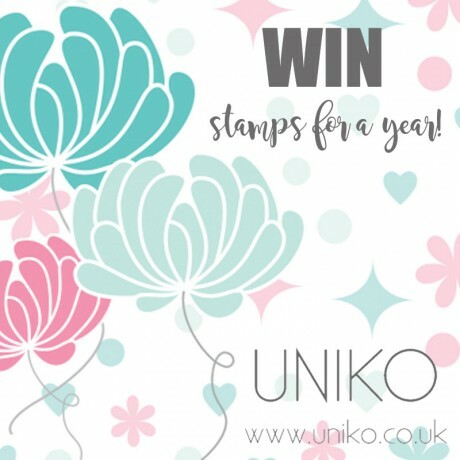 Thank you to everyone that joined in on the blog hop and for the continued support & interest in Uniko Just a little FYI, there is still time to enter my HUGE Giveaway over HERE to win stamps for a year! Thyroid Awareness Month Blog Hop! 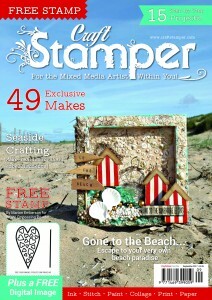 I am delighted to be a part of this wonderful hop organised by the lovely Milka Gubo from Crafty Milka. January is Thyroid Awareness Month. 26 designers from all over the World joined together in this special blog hop which will last from January 5th until January 30th. The aim of the hop is to support Thyroid Awareness Month and to raise public awareness of the importance of a Thyroid Gland and problems it can cause when not working properly. 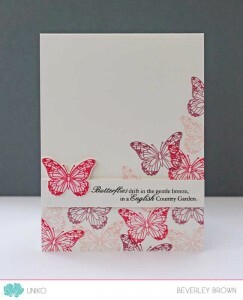 We will be sharing our handmade projects featuring butterfly, butterflies and/or blue paisley pattern. 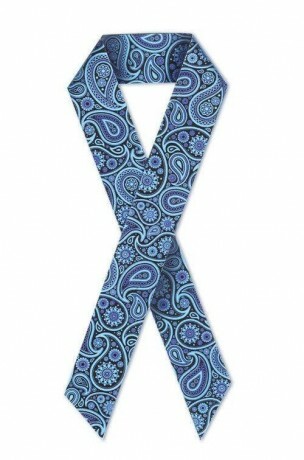 Thyroid looks like butterfly and blue paisley patterned ribbon is a new symbol of Thyroid Awareness month, so it was our choice to incorporate these elements in our handmade projects. I felt this was a blog hop I really wanted to be part of for many reasons. Firstly I was a registered nurse for over 10 years. When I moved to the North East of the UK, I began a new path of looking after surgical patients and one of the surgical patients I looked after were those who had had Thyroid Surgery. I won’t go into detail, but they were a high level observation patient post operation, with many complications to look out for. My second reason for wanting to take part is because a few of my close friends suffer from thyroid problems. This hop is just a small way of raising awareness and showing a little bit of love to those affected by it. 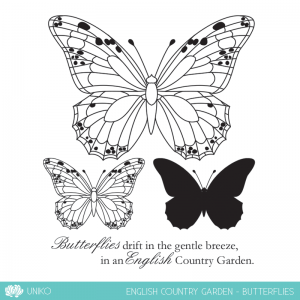 I decided to incorporate both the Paisley Pattern and the Butterfly elements, using Uniko’s Marvellous Mehndi and English Country Garden Butterflies clear stamps. The layout of my card is from the current CAS Colours & Sketches challenge seen HERE and below. 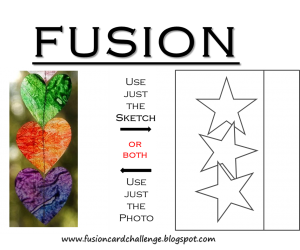 The sketch made it easy for me to combine all the colours and elements – love it when this happens! 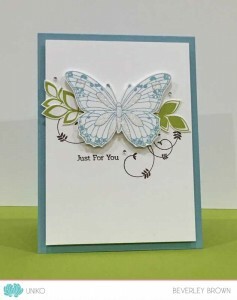 I used Altenew inks for my shades of blue a the card stock is the new Stampin’ Up! In Colour Blueberry Bushel. I also used Stampin’ Up! Stitched Framelits dies to die cut the 2 sizes of squares. Thank you so much for stopping by today, I hope I have inspired you with my card. Be sure that you catch up on all the blog hop stops (if you haven’t already) that are listed at the end of this post. A little note about GIVEAWAYS… This blog hop is not sponsored by any artist or company. Instead, there will be couple giveaways on some of the blogs along the hop. Be sure to visit each designer to find out if they are offering a prize, details about prizes and how those can be won. 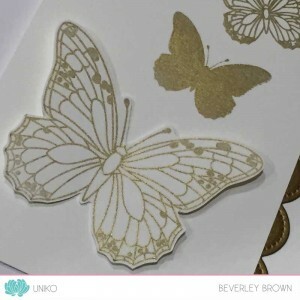 Today at Uniko we have a surprise stencil release! Earlier this month Uniko was at Stamp Magic in Doncaster and I had 3 NEW stencil designs available to purchase at the show and I am super pleased they are NOW available HERE on the website. 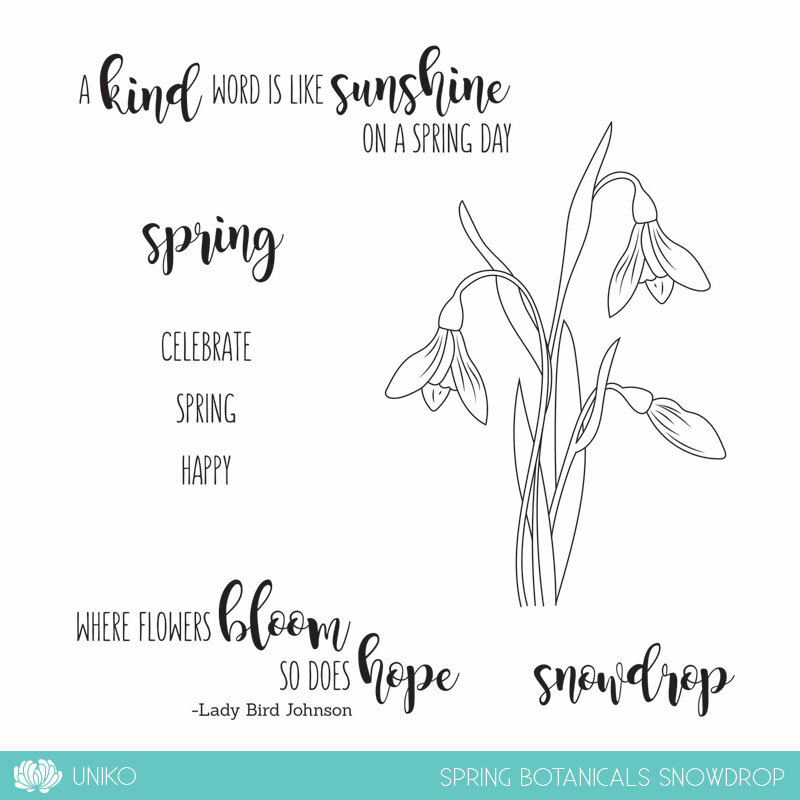 Like with any new release here at Uniko we have a blog hop to celebrate and show you beautiful inspiration using the new products. 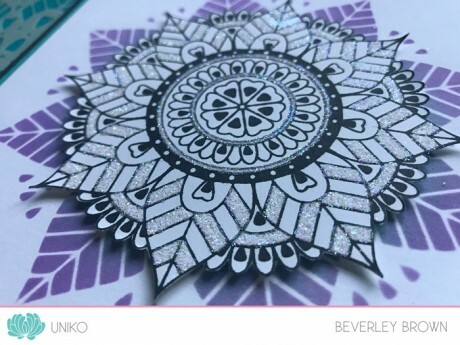 I am super duper pleased to have a wonderful, talented and all round lovely crafter joining me and the Uniko Stencil DT us as our Guest Designer…. Ruth from Crafting While The Baby Naps. Hopefully you have hopped along from Ruth’s blog, but if not be sure to check out Ruth’s amazing inspiration HERE. 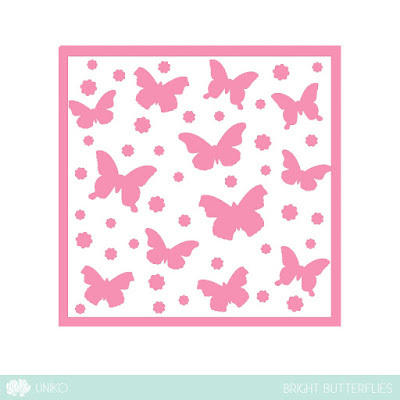 And as with all the Uniko Blog Hops we have a GIVEAWAY too! Simply comment along the hop for your chance to win one of the three stencil designs being released and as there are 3 new designs, I will randomly pick 3 lucky winners!! 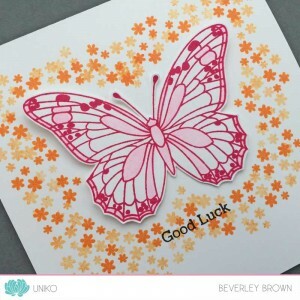 First up is the card in my sneak photo over on the Uniko Blogspot blog! 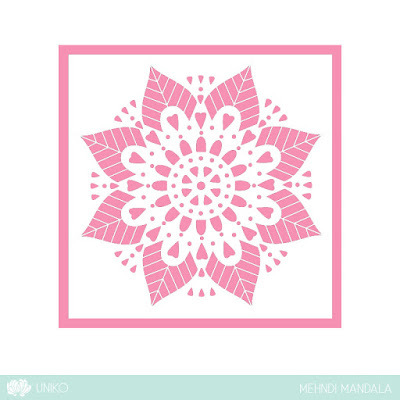 I wanted to show how the Mehndi Mandala stencil can be paired with the large mandala clear stamp from Marvellous Mehndi. I started by inking my Mehndi Mandala with Distress Oxide Inks, in Wilted Violet and Peacock Feathers. 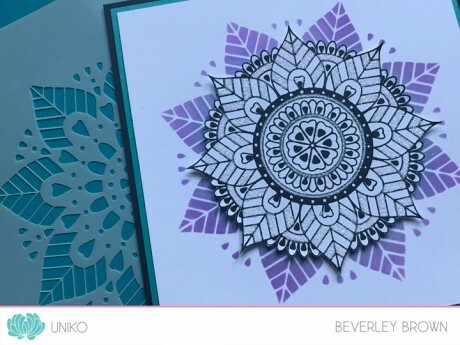 I then stamped the mandala from Marvellous Mehndi, fussy cutting it out and adding some Stampin’ Up! Dazzling Diamonds glitter to various sections. I’ve adhered it to my stencilled layer using 1mm thick foam adhesive. Again I used Distress Oxide Inks, this time Wilted Violet, Picked Raspberry and Peacock Feathers. I offset mounted my stencilled layer with some black card and onto a white card base. 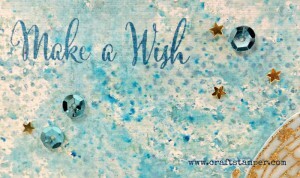 The sentiment is from Simply Said and I added an old Stampin’ Up! embellishment. I’d had the SU! 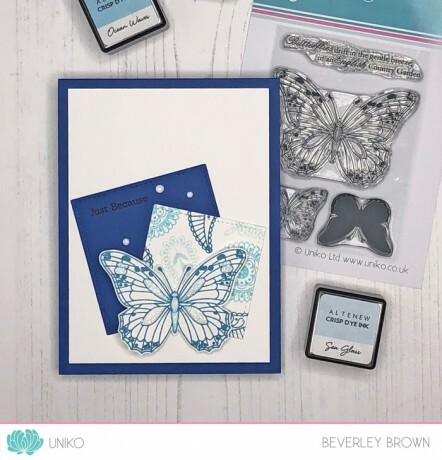 Crumb Cake card stencilled with the design since Stamp Magic, but I didn’t know how I wanted to use it, until I saw this weeks Freshly Made Sketches sketch seen HERE and below! 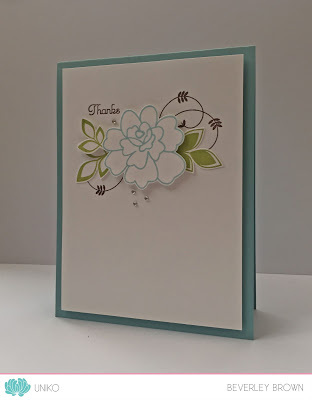 I layered my stencilled section with some scrap turquoise card from my stash and paired it with a sentiment from Simply Said Blocks II. 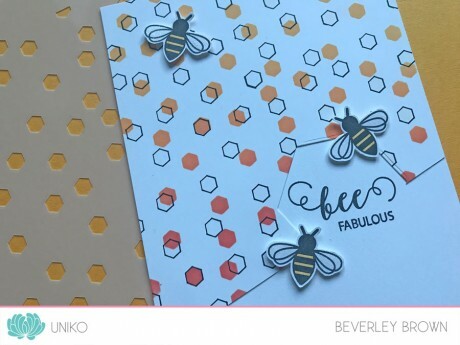 This is a fun geometric stencil and it pairs beautifully with the recently released Bee Happy clear stamp set. This time I used my new Catherine Pooler inks to blend through the stencil. I used Tiara, Tiki Torch and Tutti Frutti from top to bottom. 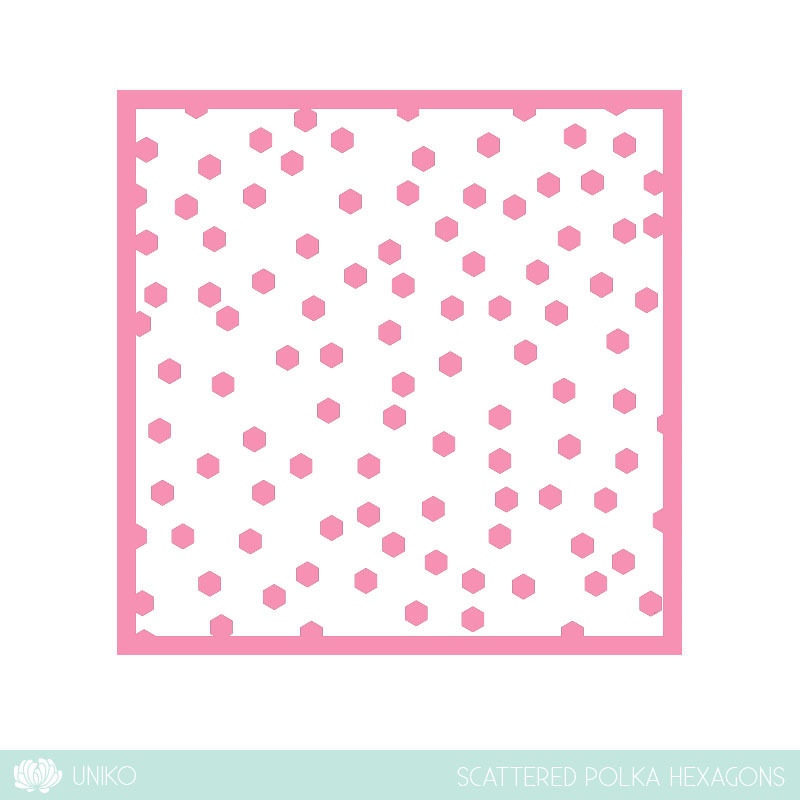 I then moved the position of the stencil slightly and used a fine liner to draw inside the polka hexagons to create a fun pattern. 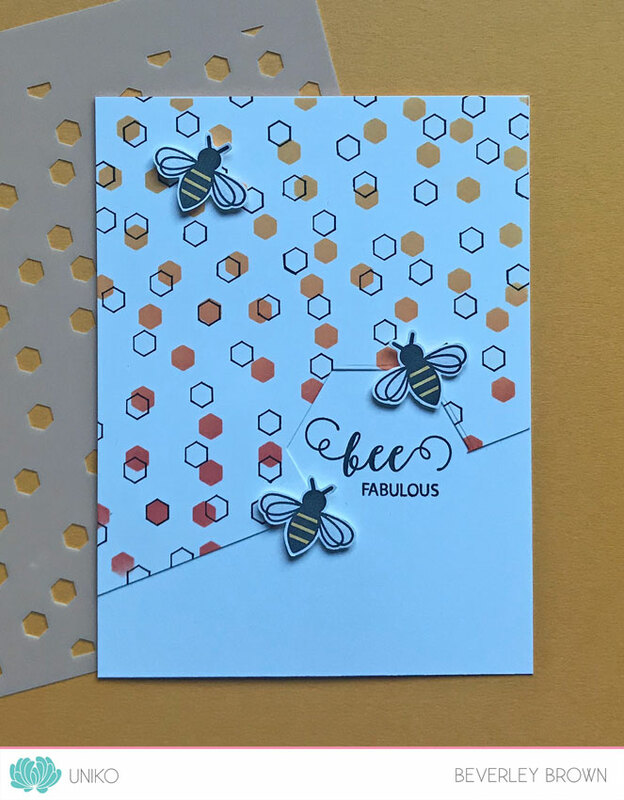 To finish the design I trimmed my stencilled panel on the diagonal, die cut a large hexagon, big enough for my chosen sentiment from Bee Happy, which is stamped onto my base card. 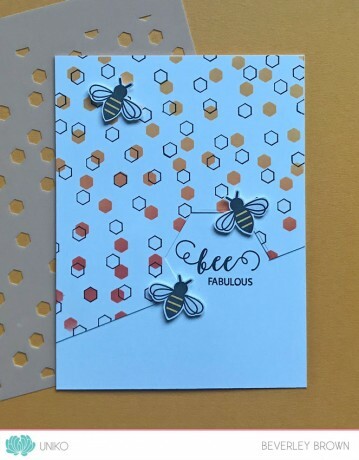 I’ve then embellished the card with a trio of fussy cut bees. That’s all the inspiration I have to share with you today, but be sure to hop around the Stencil Design Team blogs below for even more. Don’t forget to comment too, to be in the chance of being a lucky winner! Anyway, I shared some sneak peeks HERE the other day of the projects featured in the magazine and today I am back to share a few more sneak peeks at the projects featured over HERE on the Craft Stamper blog today! 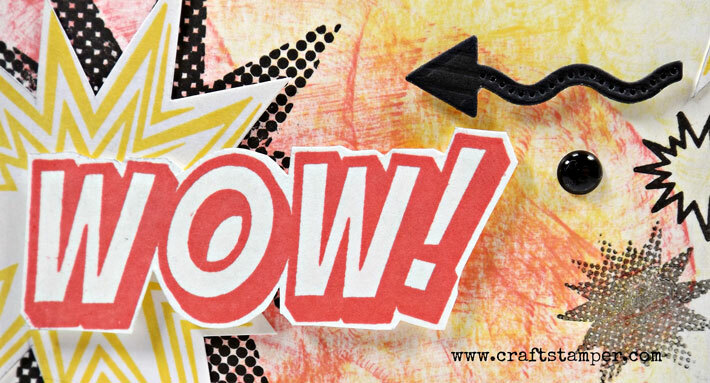 Head on over HERE to the Craft Stamper magazine blog for the full photos and details on all of the projects featured above! 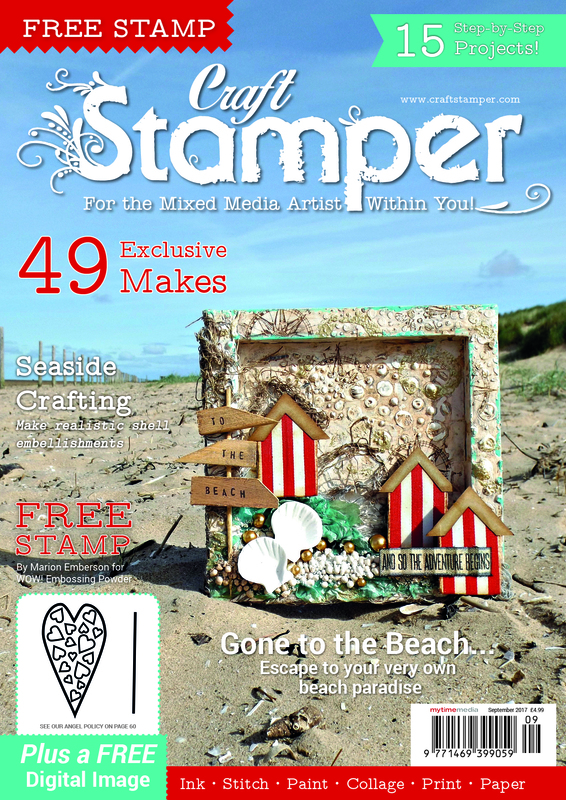 If you would like to get a copy of the magazine, here’s some of the places you can get the magazine from August 4th…www.craftstamper.com to buy subscriptions, www.mags-uk.com for single print copies, digital copies from www.pocketmags.co.uk Overseas subscriptions are available too! If you missed it Tuesday I have another fabulous & exciting opportunity for one of you. 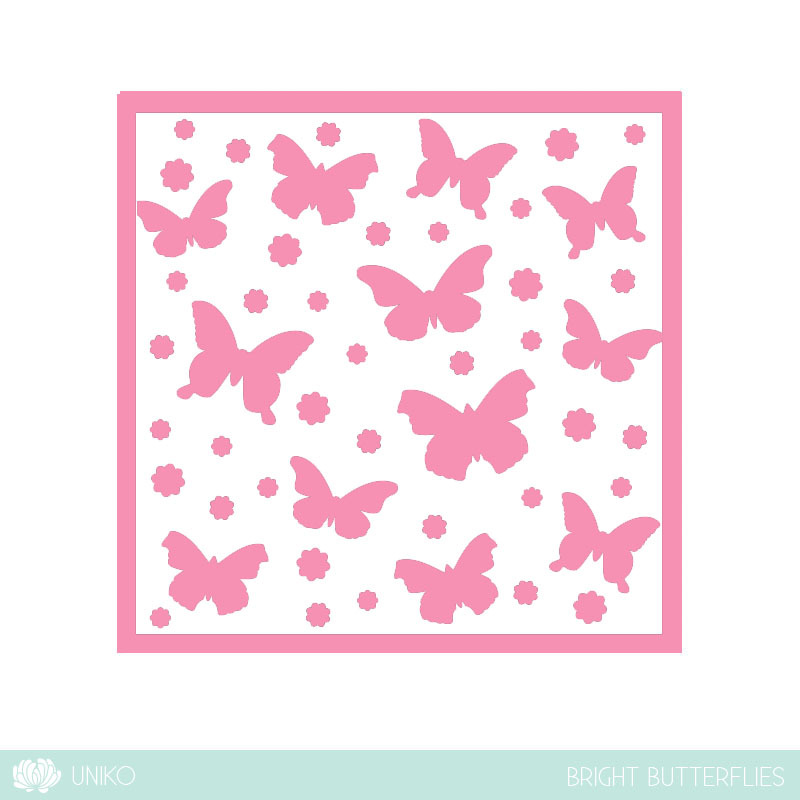 How would YOU like to be a Uniko Guest Stamp Designer? For all the details and to enter check out the post HERE. Don’t forget that this set is 20% off this week HERE in store and will be back to normal price tomorrow. I also used the new Fusion Card Challenge HERE and below as I enjoyed using the sketch so much for yesterdays card. 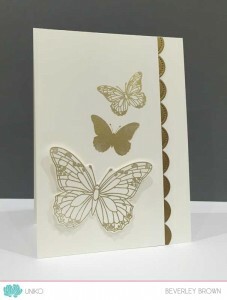 I kept things really simple, stamping the trio of butterflies in Encore Gold ink. 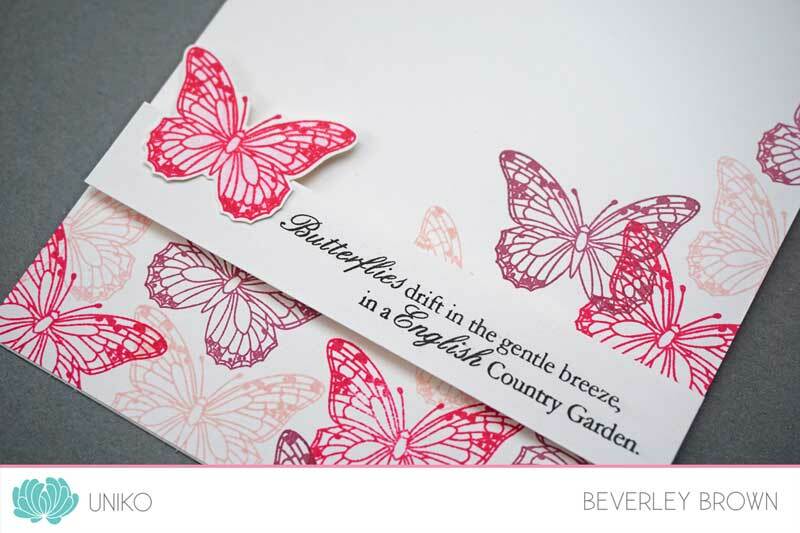 The larger of the butterflies is fussy cut out for a little dimension and I added a strip of gold CS die cut with a Mama Elephant die from the landscape collection. 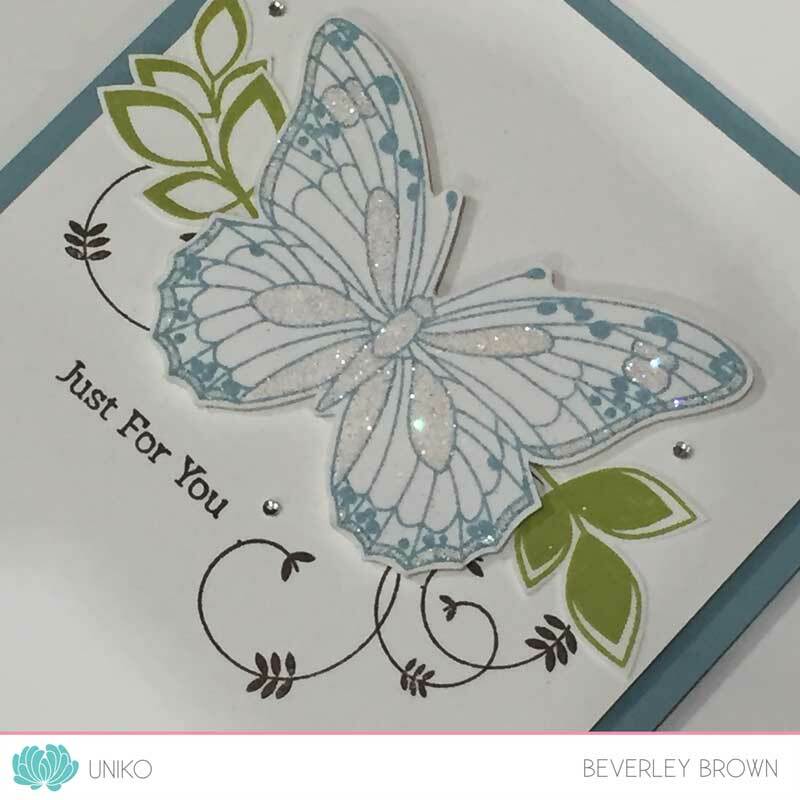 Well, I have no inspiration block this week using this clear stamp set 😉 Being one of my FAVES and a sucker for butterflies, the ideas just keep flowing. Seeing a perfect challenge adds to the fun too! This afternoon I saw the new Fusion Card Challenge HERE and seen below and immediately I knew what I wanted to do. Out came the watercolour card a trio of SU! inks and my watercolour brush. This card was SO simple to make too. I literally stamped the butterflies in the trio of colours and did some quick, rough watercoloring over the image simply using the colour from the stamped image. I fussy cut them out, added a touch of Wink Of Stella & adhered them to a panel of white CS which I have die cit using the Mama Elephant Landscape dies. This panel is then adhered to my card base using foam adhesive. Ok, that’s all from me today, I’m tired this evening after a fun filled morning at a soft play & ball pit with the beans this morning and then a clingy bean due to teething this afternoon. His brother is currently serenading him to sleep! Anyway, still lots to do for the February Release and Birthday celebrations. Be sure to keep an eye out on the blogs and social media for all the fun and GIVEAWAYS! 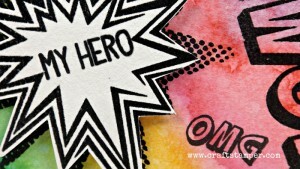 Whilst I was creating my card that I have shared HERE, this idea popped into my head! What do you think? 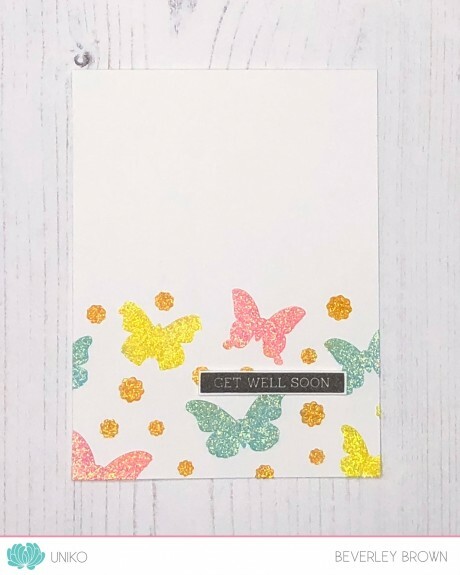 I started by stamping the butterfly in Melon Mambo then colouring with a light pink Copic marker in various places, which I then added a slight touch of Wink Of Stella to. 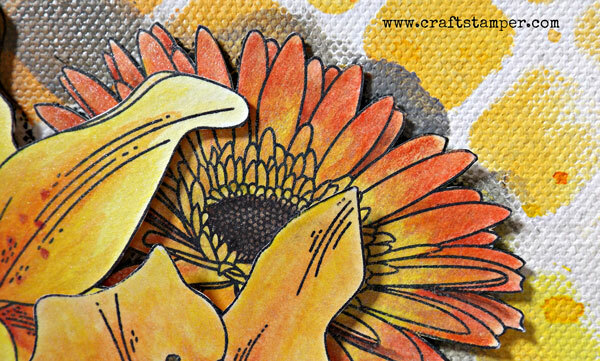 To stamp the 2 tone background using Pumpkin Pie I stamped the flower trio confetti from Balloon Bash twice before re-inking. 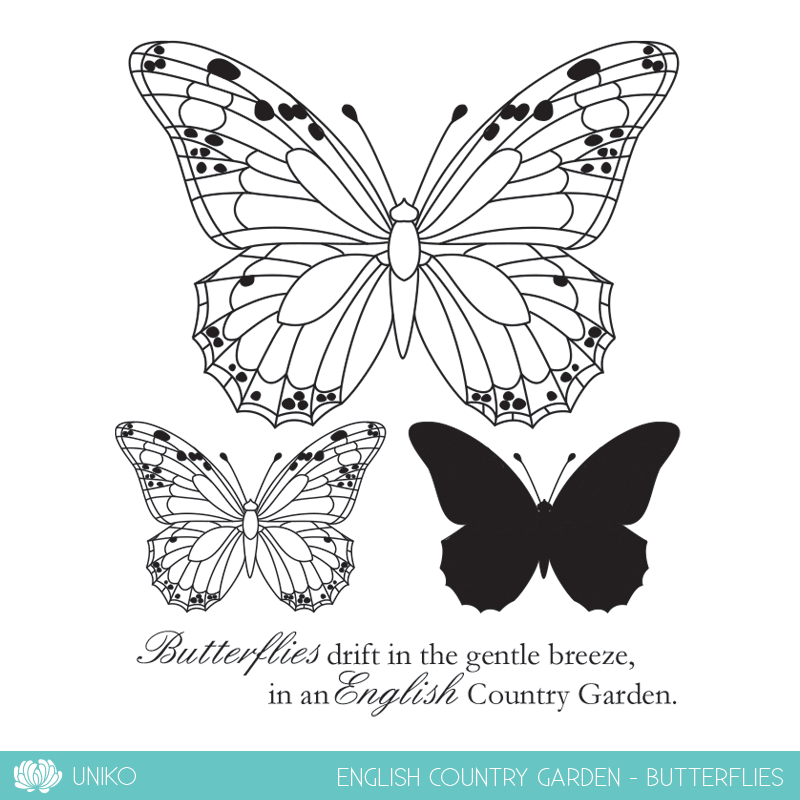 I then repeated the process around the butterfly leaving a slight border. The sentiment is ANOTHER peek at one coming in the February Release 😉 Any guesses as to what the set might be about?! Ok, that’s all from me today, I am not feeling so chirpy today, think I missed my not so little beans this afternoon. Strange how you look forward to some ‘me’ time and then when you get it I feel lost! Anyway, still lots to do for the February Release and Birthday celebrations. Be sure to keep an eye out on the blogs and social media for all the fun and GIVEAWAYS! Today I have another fabulous & exciting opportunity for one of you. 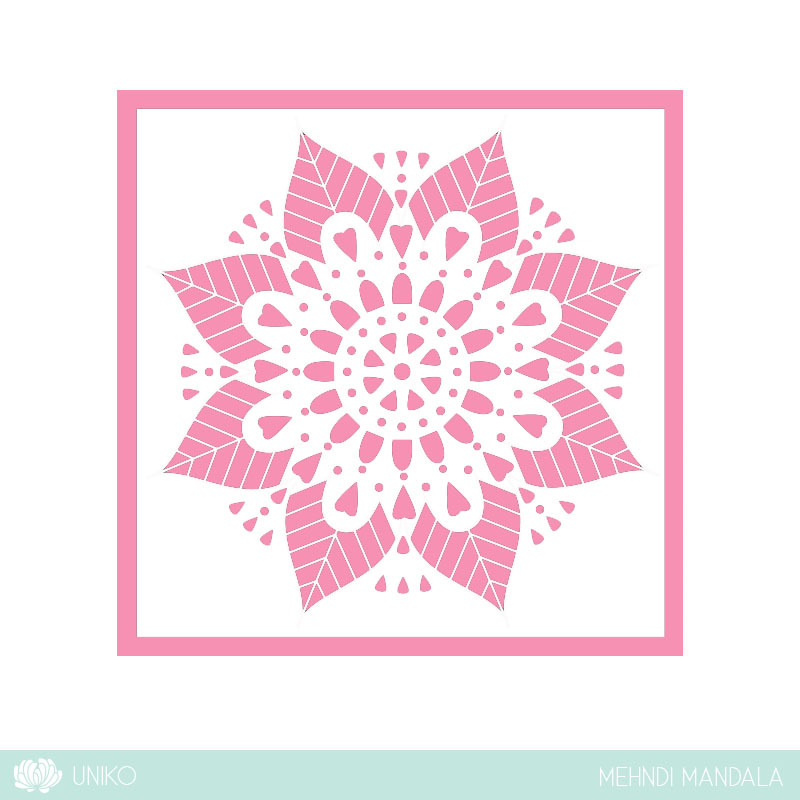 How would YOU like to be a Uniko Guest Stamp Designer? For all the details and to enter check out the post HERE. For my card today I was inspired by a previous card I made using Beautiful Blooms II and Natures Treasures II, seen HERE and below. Having used the swirly leaves on yesterdays card it sparked the idea to CASE myself! 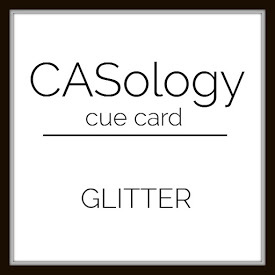 With stamping the butterfly and not colouring it in I decided to add a sprinkling of glitter, perfect for the new challenge this week over at CASology HERE, who’s cue word is glitter. 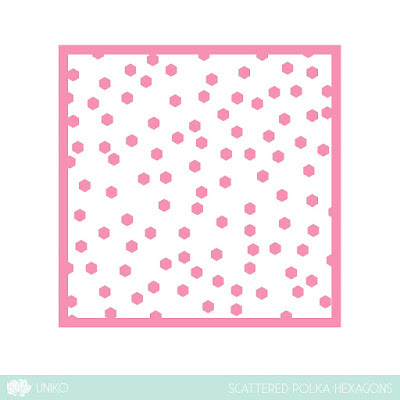 Ok, that’s all from me today, I am still super busy in the Uniko Studio surrounded by a sea of photopolymer! Lots still to do for the February Release and Birthday celebrations. Be sure to keep an eye out on the blogs and social media for all the fun and GIVEAWAYS!